Register Here for Both Saskatoon Events! ​Upon special request, Cheney Creamer will be coming to the Saskatoon area for 2 short workshops! 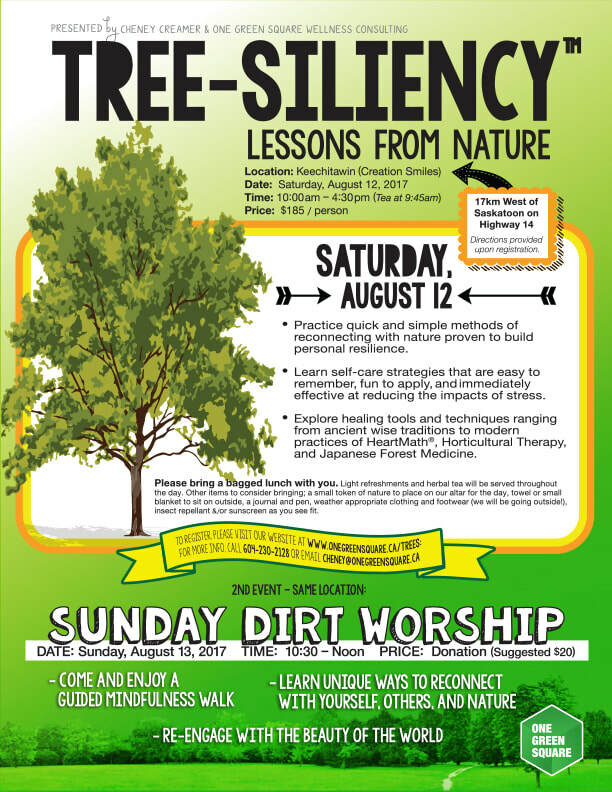 A full day workshop on Saturday, August 12th which focuses on nature-based approaches for building personal resiliency. Practice quick and simple methods of reconnecting with nature, proven to build resilience. Learn self-care strategies that are easy to remember, fun to apply, and immediately effective at reducing the impacts of stress. Explore and play with healing tools and techniques ranging from ancient wise traditions to modern practices of HeartMath®, Horticultural Therapy, and Japanese Forest Medicine. Thank you for your interest! Please use this form to register for both events. ​Payments details and directions to the event will be provided upon registration. Cheney Creamer is an Organizational Wellness Consultant, a HeartMath® Certified Coach & Horticultural Therapy Specialist. She weaves together the science of the heart & brain, with a passion for nature to create engaging activities & transformational programs.